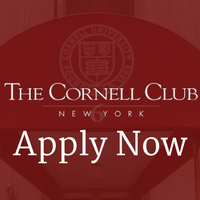 Alumni, full time faculty, and staff of our Affiliated Universities are eligible for membership in The Cornell Club-New York. Interested in Membership, but don't see your University listed? Contact the Membership Department to find out about how to become a Member. RESIDENT: Employment or residence is within Manhattan. SUBURBAN: Employment and residence is outside of Manhattan. The Initiation Fee is equal to 100% of the first year's dues. This is a one-time, non-refundable fee in addition to the first year's dues. are subject to New York sales tax, currently 8.875%.